My stepson has an ongoing mantra these days. “I just want to get out of school.” I am more than certain he is not the only senior with senioritis setting in. Its kind of funny that he is so focused on getting out of school and at the same time working on getting into four more years of school. If getting in were only as easy as getting out. And if your child wants to attend a University of California, they would need to add a third year of foreign language. So while your child can graduate from high school with bare bones classes such as having gone no farther than Algebra I and similar, getting into colleges requires a higher caliber of classes. The college and university system is no different than that of any other state. Plus, many private schools, especially the higher echelon private universities, expect even more. 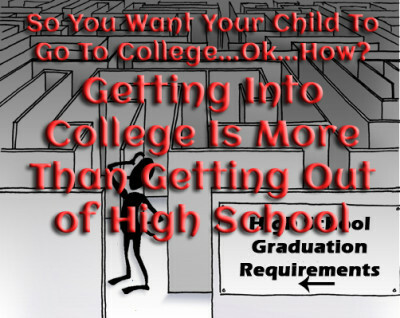 If you want your child to go to college, then focus on the requirements to get into college. School counselors can be great guides to navigating what is required to get out of high school and the extra needed to get into the colleges your child desires. But they are not just for your children to get information. A good counselor will meet with you as well. Not that long ago, my husband and I sat down with our son’s guidance counselor. At the time, our son was contemplating take 5 advanced placement classes. And the AP classes he was wanting to take were calculus, English (grammar), physics, US history, and Spanish. Yes, they are just as difficult as they sound. She was able to help us (and him) navigate the best courses that fit his long term goals, keeping him on the appropriate college track while creating a manageable schedule for him. Plus, we were able to track his following year’s classes to keep him in line to meet the requirements for graduation, getting into universities and college and keeping him adequately academically stimulated and balanced. In the end, this is one of the easier aspects of getting into college. Just make sure you and your child keep in mind that getting in to college is more than getting out of high school.